Since our expansion into the intermodal network in 1976, American Pacific has become one of California’s leading transportation carriers. 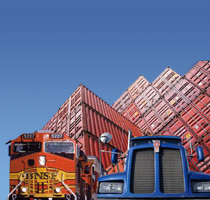 Acting as an interface between rail, sea and land, American Pacific’s services include domestic rail and international harbor drayage, regional truckload and dedicated distribution. American Pacific has been following one philosophy since its inception – “Provide the customer with the best quality transportation service available.” This is a simple concept, but one that has always been a guiding force among our people, who are, first and foremost, transportation people. This concept mirrors American Pacific’s very straightforward commitment to provide the best service in terms of quality and performance and to stand behind them with support of the same caliber. American Pacific’s success is based on a sense of responsibility, commitment to our customers as PRIORITY ONE and a continuing dedication to transportation professionalism.